Be minimalist, only buying essential items that are easy to mix and match to create new outfits. These will help us expand our creativity to create new outfits. Also, instead of having an overflowing cupboard with nothing to wear, we will know exactly what we have in our wardrobe and how to style it. It makes us think hard about what we really need and don’t need. Consider if you really need the item you are holding. “What can I do with this item after its worn out?” Can it be upcycled? Will this item last more than a year? Be aware. As consumers, we have to use our money vote wisely and avoid supporting unethical and unsustainable practices in the industry. Start questioning retailers about their practices. E.g. 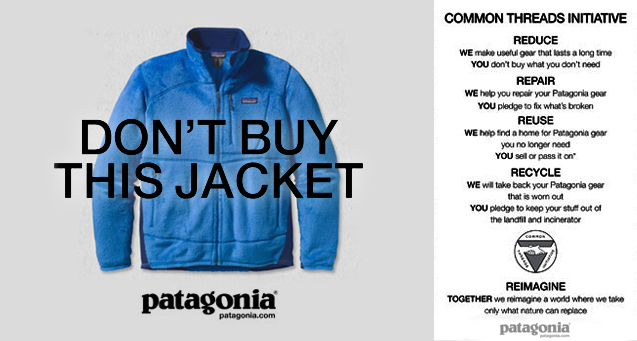 Patagonia- the first outdoor clothing manufacturer to make fleece out of recycled plastic bottles, one of the first companies to use hemp, recycled nylon, recycled polyester, tencel. They urge their customers to only buy whats necessary. Secondhand clothes that are in perfect condition can often be found in thrift stores or purchased at donation drives (for a good cause too!)(e.g. salvation army, Refash). We would spend way less on our purchases and might even find vintage items there! instead of materials that are made from animals made from animals, there are now more upcoming alternatives that we can buy instead, such as..
Biocouture on Biodegradable Fabric: Watch the film ‘The next black’ that talks about the new future of clothing where bacteria is used to make fabrics. Versace is one designer brand that has used Ingeo in their collections.